For the 2nd time in the history of Ichalkaranji a real Marathon with categories of half marathon, 21.1km, 10km and 5km are arranged. 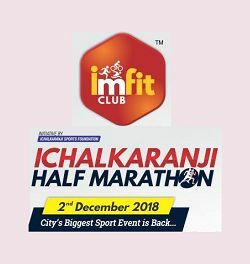 The event is conceptualized and brought into reality by the I M Fit group whose dedication towards fitness is unquestionable and who wanted to promote and nurture distance running as a tool to foster health awareness and to bring the entire local community together for a common cause. 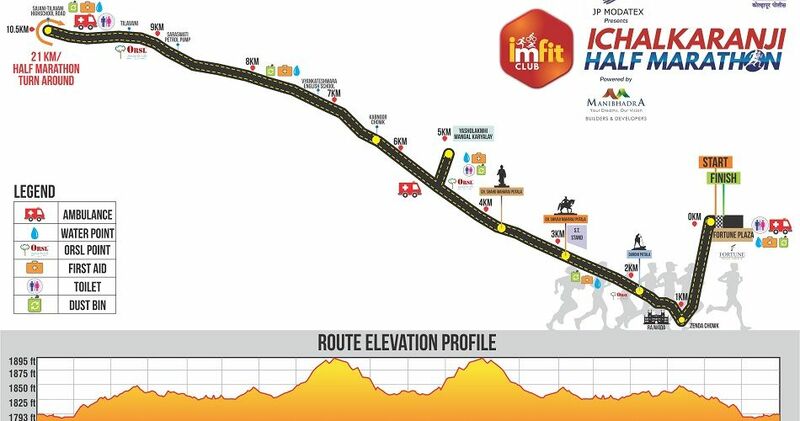 The marathon route passes through the heart of the textile town giving a visual treat about the best of Ichalkaranji. It will consist many of the scenic and historic locations along with thousands of spectators lining up the course to cheer runners. This event will become the most anticipated running festival in due course of time for Ichalkaranji. This event will create a carnival atmosphere in Ichalkaranji because of its novelty and scale. This is not a race to compete but to beat your own self. This is not about coming as the best but it is about endurance and not giving up.This is about staying put till the end and completing with a big broad smile. Arrangements ranging from halting the traffic to medical aid to hydration are all very well covered up. Whether you choose to run or walk, you’ll find no reason to complain. And of course as usual, there will be entertainment pre and post event. Race is open For all age categories. Entertainment with local artist, Dhol Pathak & Rock band, etc. will be showcased. Beyond marathon aiming to capture and highlight fitness, sportsman spirit & enthusiasm among the masses on one platform. 200 volunteers at participants Aid. The entry and bib number is not transferable or refundable to any other person under any circumstances. The registration form and the right to participate in the event is at the sole discretion of I M Fit Club. The actual participant alone shall be entitled to the rights and benefits arising out of such confirmation of participation. 1. The minimum age for the participation in 21k and 10k is 18 years. There is no upper age limit. 2. Participants must provide photo identification upon picking up their race kit to verify their identity as the registrant to whom the bib number is assigned. 3. Participant race number bibs are specific personal identifiers and may not be exchanged with or transferred/sold to any other person. The sale and/or transfer of race entries/bibs is strictly prohibited and will result in the disqualification and/or banning of any individuals involved from future event/s. 4. Each participant must sign/agree an event waiver before participating in the event. 5. All participants take part at their own wish and undertake not to participate if they are medically unfit to do so. 6. Participant must undertake to abide by the race rules, race instructions and marshal directions. 7. All participants are expected to conduct themselves in a professional and courteous manner during their participation in the event. 8. Participants may not be accompanied by anyone on race route that is not registered in the event. 9. No bikes or wheeled vehicles are allowed on the course. 10. No tobacco, alcohol or any other banned substance is permitted. 11. The organisers reserve the right to remove any entrant who is medically unfit to continue in the opinion of the Medical Officer. 12. The course will remain secured until 09:00am. At that time, the event is officially concluded and there will be no traffic protection and Aid Stations will cease operation. 13. All finish times are reviewed before times are deemed official. 14. Participants with missing or irregular split times at official timing checkpoints will be reviewed and may be disqualified. 15. In the event of any dispute, the decision of the Race Director will be final. 16. Video recording and Photographs will be taken of runners and used for the purpose of advertising and promoting the event/s. 17. Race mementoes: only finishers of 5k and 10k run, Half Marathon will receive medal and goody bag. 18. Event cancellation: the event will only be cancelled or postponed due to unforeseen and unavoidable circumstances. In such an eventuality all participants will be notified by email as soon as possible. 19. Entry fee is non-refundable. 20. Collection and use of information: I acknowledge and agree that my personal information (including medical information) can be sorted, used and disclosed by the organisers in connection with the organisation, promotion and administration of the event and for the compilation of statistical information. 22. Event officials reserve the right to modify, supplement or waive all or part of the event rules.